CAD-a-Blog: Here is AutoCAD 2016; the last perpetual license you will ever get! AutoCAD 2016 has added new functionality to many user interface elements. There are some name changes, new system variables, and additional options to already existing tools. There are also new controls for older commands. The New Tab file tab has been renamed to Start. The system variables that control it have also been updated. The NEWTABMODE system variable is now STARTMODE but it essentially works the same way. When it is set to 0 the Start tab will not be displayed. Set to 1 and it will be displayed. There are controls in the 2016 deployment creation tools that will allow this variable to be set to either on or off. Figure 1: The Start Tab will remain when creating or opening files. Pressing CTRL+Home or using the new command GOTOSTART will switch the user to the Start tab. The new command CLOSEALLOTHER will close all open files except the one that is current. The Layout tabs (paper space tabs) have been updated so that users can drag and drop them to different positions similar to Microsoft Excel tabs. The Status Bar will now automatically wrap into two rows when there are more icons than screen space on your display. The model tab and at least on layout tab will always be visible on the screen regardless of space available. The Status bar has been updated to include the Isolate Objects and Lock UI switches. They can be found in the customization menu. Figure 2: Access the Status bar icons through the Customization icon on the far right of the Status bar. The Lock User Interface tool allows users to toggle a lock on specific interface elements instead of having to use the old flyout option. Click the Lock UI button in the Status bar and a menu opens granting instant access to four different types of interface elements. Click the element you want to lock placing a check mark next to it. Figure 3: When you get your UI set the way you want lock it to avoid accidental changes. The Ribbon has a new system variable, GALLERYVIEW, that provides controls to display, or not to display, gallery views in Ribbon panels. Setting it to 1 will provide thumbnail previews of blocks and styles in the Ribbon. Setting it to 0 will turn off this functionality. The traditional Insert Menu (for blocks) or a detailed styles list (for Dimensions, Text, MLeaders, etc.) will be displayed instead. Help now has a single sign-on functionality that will allow users to “like” a topic and save it to your A360 account making it easier to revisit those documents in the future. The Help Find link will now point to commands or tolls that are in the status bar. If the appropriate icon is not available the arrow will point to the Customize icon instead. Revision clouds have been given a major rework and are much more than a polyline. There are there methods of revision cloud creation: Rectangular, Polygonal, and Freehand. The last method used will be the defaulted method the next time the command is used. It can also be set using the REVCLOUDCREATEMODE system variable. 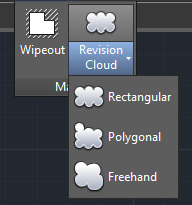 The biggest change to revision clouds is their new ease of editing. There are now multiple grips available that work similarly to editing polylines. These grips are based on the shape of the cloud as well as the method used to generate them. If a circle was used there will be a center grip. There is a new Modify option that allows users to create a new revision cloud segment and add it to the existing cloud. This was the number four item on the AUGI Wish list request sent to Autodesk. Figure 4: The Revision Cloud command is found on the Annotate ribbon panel or type on the Command line REVCLOUD. Creating Dimensions has been updated. The DIM command has combined all dimensions creation controls into one command. Simply type DIM on the command line and right-click. Figure 5: Users no longer have to find or remember the commands for the individual dimension types. The DIM command also allows users to select an object to automatically dimension it regardless of the type of dimension needed. Type DIM on the command line, select an arc and the Arc Dimension will be generated. Select a line and a linear dimension will be created. And so on. Hovering over an object while in the DIM command will display a preview of the dimension to be created and provide multiple options in the command line. When creating a Baseline dimension or using the Continue option, the interface automatically prompts users to select the first extension line of origin. The DIM command will remain active until the command is exited. 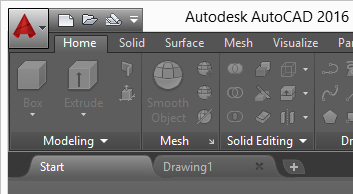 Autodesk has answered another AUGI wish list item (No. 8) with the ability to wrap text with a sizing control similar to the text editor. When dimensions are created AutoCAD 2016 will automatically create a layer for them called Dimensions. 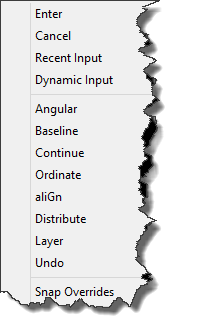 Use the DIMLAYER system variable to control this layer. It can be set to “Use Current” which is the default setting. Autodesk addressed AUGI wish list item No. 5 by adding a Text Frame option to Mtext objects that will draw a frame around the text. AutoCAD 2016 has added a new osnap addressing another AUGI wish list item (No. 2). Users can now snap to the geometric center of a closed polygon/polyline. The tooltip pop up will display Geometric Center when hover the snap location. Figure 6: The osnap glyph for Geometric Center is a circle with an X in it. Several tools have had performance upgrades. The move, copy, command preview, and property preview commands/features will now perform better during operations. Users can now move their cursors freely on the property pallet to see the changes being made. The command Preview feature now includes the Blend, Erase, Stretch, Rotate and Scale commands. The AutoCAD 2016 selection effect color can be customized but only with hardware acceleration turned on. AutoCAD 2016 has seen several small new options and enhancements to many tools we use every day. Xref files are easier to work with and there are more options when creating PDFs. There are aslo new BIM referencing tools available. Working with xref files has seen a significant improvement with a new system variable XREFOVERRIDE. This new sysvar will make all layers from a referenced file BYLAYER even if they are not. This might be my single most favorite new item in AutoCAD 2016. Set XREFOVERRIDE to 1 to set all referenced objects to BYLAYER. Set to 0 and they will behave as drawn. This one feature has the potential to save companies a lot of money in wasted time “fixing” the bad CAD practices of third party vendors. Also note that xref layers will no longer be listed in the properties pallet and will be shown in grey text in Ribbon layers lists. PDF support has been given a lot of love in AutoCAD 2016. PDF output files can now search for text that includes Truetype fonts, Polygonized test, SHX text, and Unicode characters. The Output ribbon tab now displays two different boxes for exporting to DWF and PDF. PDF options now include quality, font handling, hyperlinks and bookmarks. The hyperlink controls allow users to include links in the PDF to sheets, named views, external websites and other files and can come from text, images, blocks, geometry, attributes and fields. The bookmark feature will allow users to export links to sheets and named views and display them as bookmarks while viewing the PDF. 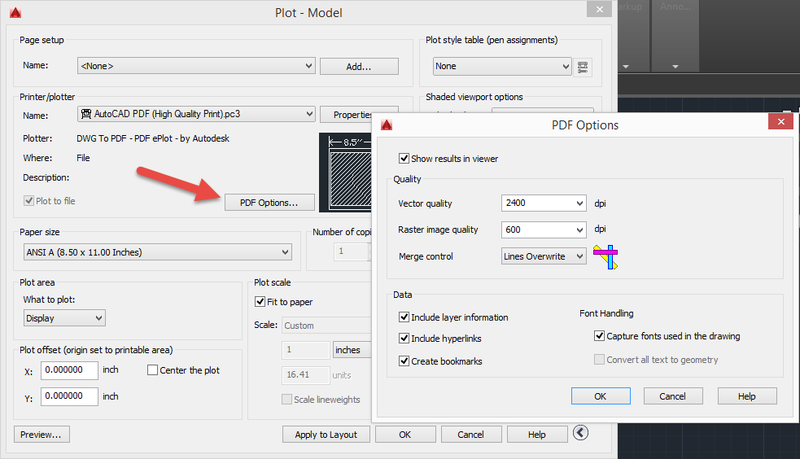 Users can also create preset Plot to PDF controls. There are similar presets available when exporting to PDF and the Sheet Set manager will also have these options. Figure 7: Print to PDF provides additional PDF creation options. AutoCAD 2016 has added support for attaching coordination files from Navisworks in either an NWD or NWC file type. Use the External Reference manager or the Attach tool to do so. You can also use the new command CMATTACH to attach Navisworks files. Users can also attache single or merged models from BIM 360 Glue via the updated BIM 360 Add-in tool. 3D Design tools in AutoCAD 2016 didn’t see many changes except for an overhaul of the rendering engine. Mental Ray is out and new, easier to use render engine is in. The Section Plane tool can now work on point clouds and has a new Slice type option. The Slice type creates a section that is cut on two sides like slicing a piece of cake. The other Slice types cut only one portion away from the 3D object. The Slice type creates a thin cut through the model that will always be parallel on its front and back and cannot be made with jogs. The contextual Section panel has been changed to a contextual ribbon tab and includes command for toggling Live Section on/off and other Section object controls. Now that Section Objects can generate sections for Point Clouds there is a new dropdown panel button in the ribbon. This new Section Plane tool will help to create section objects of your point cloud for different orthogonal planes (front, back, top, bottom, left, right). Users can also use the new Extract Section Lines tool on point clouds. Cut a section and tell AutoCAD to generate linework from the points in the point clouds. There are also new point cloud controls available. Users can change the new transparency setting for the points. This makes seeing behind the points easier. Point Clouds now also support Dynamic UCS features. Also added are Point Cloud Object Snaps. They include Intersection, Edge, Corner, Perpendicular to Edge, and Centerline. These new osnaps will make working with Point Clouds easier. Figure 8: The new Point Cloud osnaps can be accessed in the drafting settings window. Working with large Point Could files is a bit easier because of the new Point Cloud cropping tools. They work similarly to cropping an image and users can save them as a point cloud state. This will allow for quick navigation from certain views, angles, and point states. The Point Cloud Manager can control which sets of points are displayed. If there are several different sets of scans or regions they can be turned on/off similarly to turning on/off specific layers. Perhaps the biggest change to using 3D in AutoCAD in the last several releases is the replacement of Mental Ray for 3D rendering. This new method uses a physically based path tracing rendering engine that is much simpler to control. The new rendering UI has fewer options to choose from and is straight forward. The updated Visualize ribbon tab has the render engine controls and includes several preset drop down rendering options. The controls now have settings for the number of levels to render or the amount of time to render. There are controls for low quality to high quality rendering but the new time based rendering options will give you the best rendering possible in a set amount of time. You can render as much as you can for a quick five minute coffee break, for a full 60 minutes during lunch, or for twelve hours when you leave for the day. There are also drop down controls for the size of the render and for file type. The changes to a simplified interface allow for a significantly easier rendering experience in AutoCAD. 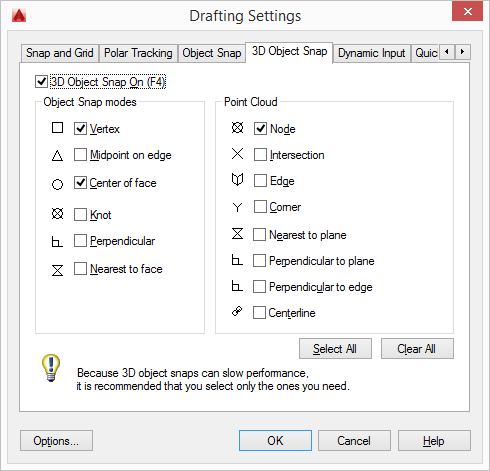 AutoCAD 2016 has improved graphics performance for displaying lineweights. If users are running DirectX11 and have hardware acceleration turned on circles and arcs will be displayed perfectly in the 2D Wireframe visual style and will be smooth at any zoom level. Also users will not have to perform a manual Regen when zooming or panning as far as possible. A new system variable, CURSORBADGE, will control the display of the badges near the cursor. Many users found this feature to be distracting and wanted it gone. Now it can be turned off when set to 2. A value of 1 keeps it on. Remember how AutoCAD often resets the FILEDIA sysvar to off when it crashes? The new System Variable Manager tool will let you know when listed system variables are different from your defined setting. Create your list, define the setting for each one and let it run. If something changes the user will be made aware via bubble up. Use SYSVARMONITOR to open the control window and use SYSMON to turn the monitoring feature on/off. 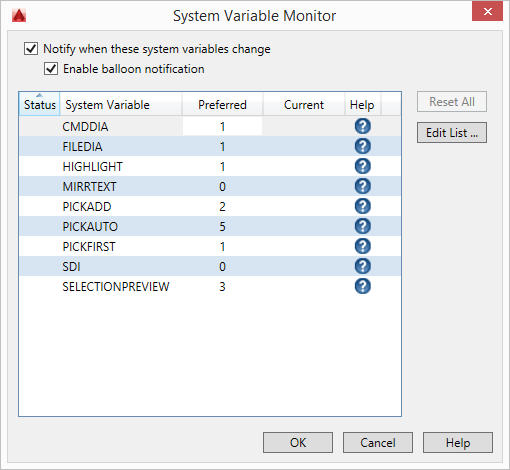 Figure 9: Click the Edit List option to change which system variables will be monitored. 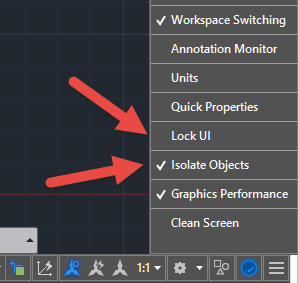 AutoCAD 2016 Security controls on the Systems tab in the Options dialog box were renamed from Executable file Settings to Security Options. There are now slider controls to adjust the security level as well as more control options to define what is trusted. Users can open this dialog box with the command SECURITYOPTIONS. When using an AutoCAD 2016 vertical users will no longer have to wait for AutoCAD updates. They will be able to install a Single Service Pack for the AutoCAD component of their vertical product. All in all I like this version of AutoCAD. No it doesn't have a new tool or feature but much of it is new. It's better than before, the tools are more consistent and they do more. I would recommend everyone get this version of AutoCAD. AutoCAD 2016 is a very important release. Its biggest surprise might be that it is using the 2013 DWG file type and didn’t introduce a new one as has been Autodesk’s pattern since 2004. It lacks the inclusion of a new major tool but instead focuses on updating several existing commands. The enhancements are great and will be very useful. It is also very nice to see so many AUGI Wish List items addressed in one release. But AutoCAD 2016 is very important because of Autodesk’s announcement of the end of the ability to purchase perpetual license in February of 2016. This end means that AutoCAD 2016 will be the last stand alone perpetual license of AutoCAD that anyone will be able to purchase after that date. New versions of AutoCAD will be available, but none of them will be perpetual. Consider that fact when you think about updating to AutoCAD 2016.